Lut's biopsy results came back yesterday and confirmed multiple myeloma. His oncologist started him on an antiviral yesterday, and today he stars chemotherapy and a steroid. The oncologist thinks that this has a good chance (70%+) of improving his situation, including his mental state. The oncologist said it would be 6-9 weeks before we know if the chemotherapy is working. His nurse yesterday thought the steroids might have a beneficial effect on his mental state in the short term, like the next few days. I hope so, because he's only gotten worse so far. I looked through his gmail and found email addresses for three of his siblings, from 2009. I tried emailing them this morning to let them know. One of the addresses bounced. I don't know if the others are still active or not. I have a rental car for a month. I think I should probably buy a car. I am not ready to face doing that yet, and I kind of need to. In theory, he qualifies for Medicaid and disability, especially since we're not married. Since we're not married, I can't sign documents for him. He is neither lucid enough nor tractable enough to sign documents himself. I haven't figured out how I am supposed to get around this yet. I will talk to the hospital staff today and see if they know. The application form wants a bunch of medical specifics that I don't have anyway. But all will be well, and all will be well, and all manner of thing will be well. For most of my life, when my dreams have a memorable location, my brain uses a real building for the layout. Usually it's a house that I lived in, but sometimes it'll be a workplace or something. In the dream, the house I grew up in often stands in for some totally different place by dream logic: we're in a post-apocalyptic laboratory that oddly looks just like a 200 year old rambling three-story house. Architecture design is not my strong suit. But over the last few years, I've had several dreams where I'm living in a house that my parents passed down to me. It's always the same place in my dreams, but it's not a real place that I've ever been to in waking life. In the dream, I am so convinced that this is a house that I grew up in that when I wake up, it'll take me a while to remember the house is fictional. Also, my parents are very much alive and not going to pass down a house to me, thank goodness. I dreamed about it again last night. It was cluttered with stuff, like back-to-back dressers in the bedroom, as if it had already been furnished and then someone just jammed in the furniture from another house wherever they could fit it. That was an artifact of inheriting the house. It was huge, room after room after room, all of them with too much stuff. Two stories. There was a long balcony facing the backyard along the second floor, and a separate apartment in the house was sublet to other people. We shared the back balcony. The back balcony has an outdoor staircase going down to the backyard. The master bedroom had a partially sunken hot tub/bathtub, with padded sides. I would like to note that this would be a cool thing to have in real life, although not if it was going to leak the way the dream one did. Dream-Lut and I don't sleep in the master bedroom, because it's too crowded with stuff. We have a couple of rooms that are relatively decluttered and we mostly stick to them. In the dream I thought "I should get rid of this stuff we're not using and don't need, we'd have so much more space." Anyway, they've not been a particularly interesting set of dreams otherwise. I just find it curious that my brain has finally devised its own set for a dream and now it keeps wanting to re-use that set instead of one of the real places I've been to. Some time shortly after I moved to Kansas City -- so almost 20 years ago, I'd guess -- I visited my friends and relatives on the east coast. One of the things I wanted while I was out there was cheese blintzes. These are a kind of crepe wrapped about a filling of sweetened farmer's cheese. I love them and you can get good ones in restaurants on the east coast, and mediocre frozen ones in groceries, and you can't find them at all in the midwest. (Or they are horrible imitation cheese blintzes full of sorrow and despair, like the dreadful cottage-cheese-stuffed-pancakes that IHOP used to sell). We went to one restaurant for breakfast that had a huge buffet, and my sister, Margaret, told me that they usually had blintzes out. But we went through the buffet and there weren't any. So when the waiter came over to ask how we were doing, I asked if they had any blintzes. He told me he'd see what he could do. Several minutes later, he returned with a plate of them, to my delight and surprise. My sister*, Margaret, commented afterwards, "That just made me realize that, if you want something, sometimes it helps if, in some fashion, you actually tell somebody that you do." For whatever reason, this moment has stuck with me since then. I was thinking about it on Tuesday, because my department was buying pizza for all the associates on Wednesday, and the coordinator emailed me to ask what I wanted. Pizza is not my favorite food, although there are a few kinds that I like and one that is even sold by a pizza-delivery place. But my absolute favorite thing from a pizza-delivery place is Domino's "pasta in a bread bowl", which is, by the way, amazing. It's like pasta inside a deep-dish pan pizza. I get it with alfredo sauce and spinach and pineapple. I am the only member of my department at my location, so I decided, what the heck, I will ask for the kind of thing I actually really like, even if it is complicated and not actually pizza. And I gave my pizza preference too, just in case. The coordinator emailed me back: "I think we can get you your very favorite thing :)". So that was my lunch Wednesday, and my lunch again Thursday because the thing is large and chock-full of about a billion calories (I think they baste the bread bowl with garlic butter or something. It is so delicious). * Technically, Margaret was my sister-in-law at the time. She and my brother have since gotten divorced, which happens and my brother has a new wife and I love her too. But I am keeping Margaret so she's still my sister. I went to Starbucks on Sunday. The weather was iffy for bike riding: small chance of showers before 2PM, than larger chance of rain/thunderstorm after 2PM. So I left the house a little before 11AM and planned to get home by 2PM. The three-mile ride to Starbucks is a lot longer when it's cold and damp and I haven't regularly biked outside in several weeks. An eight-mile ride to Panera (sixteen both ways) was out of the question, given the probability of rain and the narrow window in which I was likely to avoid the worst of it. At Starbucks, I ordered chai with no water, on the advice of a Twitter friend. It was very crowded at Starbucks, so I took the only empty table, a small high one in a corner, with a man at the adjacent table also using a laptop. We exchanged a few amiable remarks about the crowd and then devoted ourselves to our respective electronic devices. After five or ten minutes, the man left, and I had the corner to myself for a few minutes, until a different man approached. He said, "Good morning," in a friendly way, and offered his hand. "Hi there!" I replied, cheerfully, because I am not adverse to a few minutes of random chitchat with strangers at a coffee shop. I shook his hand. "What I am about to say will change your life!" he told me. He sat down, shifted to close and leaned back to look at my laptop screen. My categorization instantly went from "friendly stranger" to "scammer." I am not one of those people who has been so conditioned to be polite that they will be nice to anyone, no matter the circumstances. I am fine with being rude. "Excuse me," I told him. "I am very busy." I changed the angle of my body and my laptop so that I could use it without him seeing my screen, and then I steadfastly ignored him. Or more accurately, did not visibly react to anything else he did. He muttered something like, "Fine, I'm never gonna tell you", to which I thought great, please shut up and leave me alone. He continued to mutter at me for a few minutes, sitting sideways in his seat so that he could face me. Then he shifted to face forward, and started loudly telling a group of three women three tables away that someone had taught Jessica to be racist. I don't know who Jessica is or what she did that was racist. I am pretty sure that the three women he was ranting at did not know either. At this point, one of the Starbucks baristas caught my eye with a look of 'do you need help?' and I tried to signal 'HEAVENS PLEASE YES' without actually saying anything or acknowledging Creepy Guy's existence. I was fussing with my bag to get out my headphones and iPod in an effort to get a bonus to my Ignore Harassment roll. The barista leaned against Creepy Guy's table and told him, firmly, that he was being too loud, and he wasn't even a customer, and he needed to stop annoying the patrons. Creepy Guy shut up for about five minutes. I had my headphones on by this point. I'd been trying to get some writing done but was making very little progress because DRAMA. After five minutes of peace, Creepy Guy decided he needed to talk at me again and started talking loudly and waving his hand in front of my laptop screen. I turned the volume up on my iPod. He touched my arm. I told him not to touch me again. He subsided for a bit. Then he started fussing with the chair opposite his table. He positioned it so that it filled the space between his table and mine, and then put his legs on it, which had the effect of boxing me in between my table and his legs. I gave up on waiting for him to GO AWAY and left by shoving my table out from the wall so I could sidle past it. I sat down at a different table, because some spot of pride in me felt that, well, I'm not bothering anyone and I shouldn't have to be the one to leave. Also, it was sprinkling outside and I was hoping for a break in the weather before I left. Creepy Guy remained a few minutes at the same table. Brave Barista approached him again, presumably to say "QUIT IT." Creepy Guy followed me to new table, tried to talk to me, touched my arm again, which got me to say "Don't touch me" again without me ever taking my earbuds out or hearing anything being said. Brave Barista had More Words for him, then went back to work. A minute or two after that, Creepy Guy finally left. After Creepy Guy left, Brave Barista came back to my table. "I want to apologize for that man -- "
"Oh bless you for finally driving him off," I told him. "Yes, well, I'm afraid he's been around a lot lately and bothering the customers. We'd called the cops, and I was actually trying to stall him until they arrived so that he could be banned." Brave Barista gave me a little Starbucks gift card and apologized again. I did a little writing. Maybe twenty minutes later, Creepy Guy returned to the Starbucks, but he didn't approach me. He talked to some other patrons and bought a sandwich. Brave Barista, whose name proved to be Dan, kept an eye on him. I'd been tweeting about this whole episode as it unfolded, and I started to tweet "Why can't I meet weird strangers who are funny at the coffee shop, like Ursula Vernon does, instead of weird Creepy Ranting Guy?" And then I stopped, and thought about some of Ursula Vernon's tales of interacting with strangers. Some of them are genuinely merely bizarre, and some are just funny. (There is really no way to relate the star-crossed love of a rooster and a turkey without it being funny.) But most of them are funny as much because of the way she tells it as because of what happened, and some of them are pretty awful once you take them out of the context of "Ursula Vernon boggling humorously at how is this actually happening to/around her." If I'd listened to what Creepy Guy had said, and if I'd had her gift for humor, I might have been able to showcase his rantings as "weird and funny" too, instead of "ZOMG WHEN WILL THE COPS FINALLY GET HERE". So I commented on that fact instead. Ursula replied with, "Yes, but that's my coping mechanism for creepy things, so it's okay! We all have different coping mechanisms!" Creepy Guy did come back to sit next to my table again. I don't know what he said, because I turned up the music as soon as he returned. He reeked of alcohol now. Not long after, two cops actually showed up and bracketed Creepy Guy while he was sitting two feet away from me. I paused my music to listen as they took his name -- somewhat dubious on whether or not he was telling the truth about his name -- and told him he was banned from the Starbucks, and he'd better not already be banned from the plaza because if he was they were going to take him in. They escorted him out of the shop. I would call this a victory for my "Ignore Them Until They Go Away" method, except that I had to leave myself ten minutes later, to dodge the anticipated storm. But the thing that stuck with me from the whole incident was that realization about how the line between "funny" and "distressing" is in significant part based on your attitude and the way you tell the story. It also made me realize that I cope with awkward/uncomfortable/creepy by trying to ignore it and carry on with the thing I wanted to do. It's the same coping mechanism I developed in grade school to deal with bullies. In fact, Creepy Guy had NOTHING on the kids who harassed me in junior high. He wouldn't even be in the running. By childhood standards, this barely even qualified as an attempt at harassment. Twelve year-old me would be so jealous that this is the most obnoxious stranger I've dealt with this decade. SO JEALOUS. I don't know how to tell this story so that it's funny, but I am thinking about that now. I don't think I have the right temperament to treat this kind of awkward/unpleasant situation with a sense of humor (never mind having the comedic gift to make it actually funny). Still, it's an interesting thought. I will be at WorldCon this year! As I've mentioned a couple of times before, and probably should've mentioned again before the day it starts. Oops. Two contractors who called me on 7/7 and said they would call back to make an appointment. Never heard from them again. Two contractors that I left messages for and never heard from. One contractor that made an appointment, showed up on time, told Lut how he'd recommend fixing it, and did not give Lut a price. He said he would write up an estimate for me and send it. That was a week ago. Never heard from him again. And then there's Crestwood Painting, whom I'm going to call out because I am especially unimpressed by them. On Thursday morning, 7/7, I used their web form to make an appointment. Yesterday, I got a confirmation email from them that they would be out, to remind me to be home for the appointment at 1:30PM. Today, three hours before the appointment, I got an emai saying "oh, your job is too small for us. We're cancelling the appointment." Because at no point in the last 11 days could anyone look at my message and see what my request said. Bear in mind that they didn't get any new information from me: they are responding to my original request for an appointment. In the meantime: I have no freakin' idea how to get my ceiling fixed, since "contacting firms that say they do ceiling repair" is obviously not the way. Right now, Terry's suggestion of "just never look up" is looking better all the time. Put away two of them (the last one is towels and can wait in the dryer until the next time I happen to go downstairs). Put anti-flea powder on the carpeted stairs to the basement and vacuumed them. My indoor cat has fleas. WHY. I got the anti-flea stuff from the vet for the back of her neck 6 weeks ago and have given her two treatments so far, but the fleas Will Not Stop. I am keeping them in check by flea-combing her daily and vacuuming the whole house every day or two, and have sprayed several times. But the basement stairs are attached to the area where I keep the litterboxes, so I hadn't done them. When I did laundry I realized the steps were flea-ridden. UGH. Scheduled an appointment with a contractor to get an estimate for replacing the fallen ceiling section. Started and mostly finished a cover painting for The Moon Etherium. Watched Disc 1 of SyFy's "The Expanse". It's that last one that's making me feel like I did nothing at all this weekend. Spending ten hours on a painting doesn't count for my brain. Stoppit, brain. Just stop. It's not that late on a Sunday but I kinda want to just go to bed. Anyway: no new disasters so far this weekend! \o/ So there's that. I was not totally idle while I was visiting friends (Sophrani and kagetsume) and my parents for a week, because my father goes for a two-mile walk every morning and I went with him. I put together about half of an outline for The Sun Etherium while I was visiting my parents. I was not happy with what I had so far and didn't feel like it was gelling, though. So I put it aside and hauled out Birthright again towards the end of June, and wrote perhaps 4000 words of it. I contacted two different artists about doing the cover for The Moon Etherium. Both asked for more details about it. Neither got back to me after I provided details, not even to say "No, thank you". In other news, trying to hire an artist is every bit as awful as I expected it to be. -_- Hey, okojosan, I don't suppose you want to do a fantasy/romance book cover? I did a lot more editing on The Moon Etherium while I was in North Carolina and before. I need to do a final read-through and there are a few more changes I might make. I decided to let the book lie for a while before that. Maybe a month. We'll see if I make it that long. Not a lot. A couple of pencil sketches that I liked, a few color doodles that I didn't, another cover mock-up for The Moon Etherium. My mother addicted me to Spider Solitaire (it's more interesting than regular solitaire, I promise). I spent a week in North Carolina visiting friends & family! My vacation was surprisingly relaxing. Usually I come back from vacations feeling like I need another vacation, but this one was mellow and I had lots of time to myself to rest and play with electronics. And edit my book. It was good. I decided to do Camp NaNo and set my goal at 20,000 words on Birthright. I'm at 9500 now, so that's going fine. Also, I am back to counting words, since I did that with The Moon Etherium and it worked great and even came out at estimated length. In other news, I now consider a thousand words a day to be a modest, easily-achieved goal. Kind of "minimum effort if I want to consider myself to be trying at all". So that's a thing. Depending on how writing Birthright goes, I may or may not get back to The Moon Etherium for my penultimate editing pass. We'll see. The man who put my lunchbag on the bus told me that he saw someone else looking through it, and didn't know if anything had been taken. "That's all right," I told him. "There's nothing of value in it but these." I waggled my leashed keys. "Which are only valuable to me." I called Rick at the bike shop at 4PM yesterday. "I forgot to mention, but the back tire had fallen off the wheel when I tried to change it and discovered the broken axle (or broke it). Will you check and make sure the tire and/or tube is okay?" "It's holding air fine," he assured me. "Been inflated for two hours, no problems." He repeated this when I picked it up 90 minutes later. This morning when I got it out of the garage: completely flat. I kind of feel like the universe is telling me, "Quit dreaming about retirement, quit living in fantasy worlds, and just PAY ATTENTION to the real one. Like a real adult." On Saturday or Sunday, Lut commented, "Is it just me, or is that crack in the ceiling getting bigger?" I looked up. A crack ran much of the length of the ceiling over Lut's side of the den. "I don't know. I don't remember it." I didn't think too much about it: cracks happen sometimes. House shifts or whatever. Tuesday night, as I sat at my computer and my cat, Kali, sat beside me in Lut's seat, I heard distant fireworks. Guess some people aren't done with the fourth yet, I thought. I felt bad for my cat. Then there was a sound like hail. My cat looked up, glanced at the window, and the hail intensified. Kali bolted from the room, as is her wont whenever strange noises are coming from the sky. She's sure it's going to fall on her. Then a six foot by three foot section of the ceiling collapsed over Lut's seat. It rained down in chunks of plaster and sheet rock. We have about 8 garbage bags partially full of the stuff now. "Partially full" because it is heavy. I'd guess that section of ceiling was 150-200 lbs of stuff. My cat's lifetime of paranoia about the sky falling on her? NOW TOTALLY JUSTIFIED. If Lut or I had been sitting under it, we'd never have gotten out of the way in time. Kali: NO PROBLEM. She was out of the room and probably halfway down the stairs before the first chunk fell. 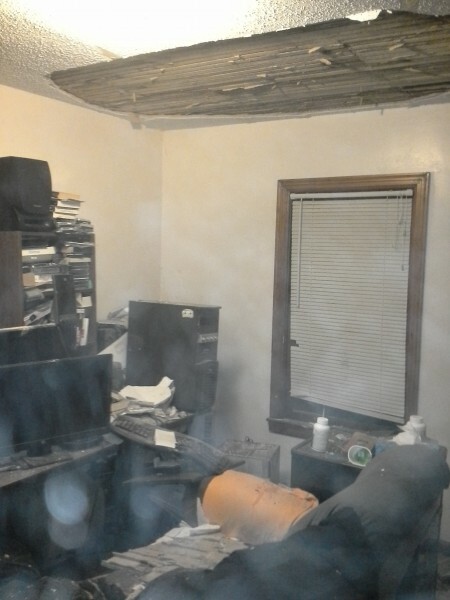 We have it mostly cleaned up now, though bits of dust are still settling from the ceiling boards. No signs of water damage. 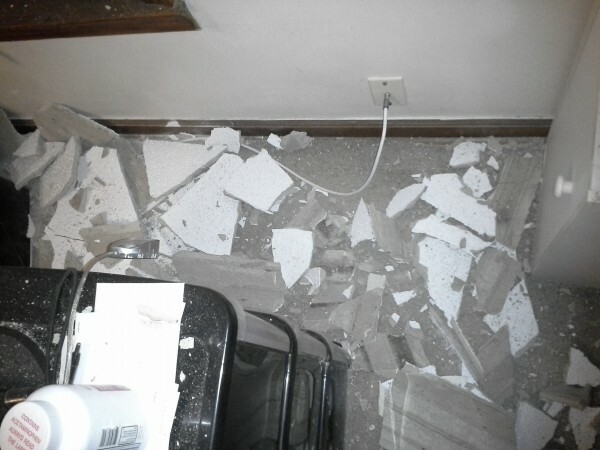 According to the internet, apparently ceilings just spontaneously collapse some times. I will keep an eye out for other cracks. There aren't any in the rest of the house. I checked. I leave you with a small section of the kind of wreckage that covered half of the room. All the electronics seemed to have survived, so that's good. Anyone know a good plasterer? Today was the day I tried to fix my gaffes from the weekend. I called Enterprise this morning: they had found my phone, but I'd have to pick it up: they wouldn't drop it off for me. Rats. My second thought was to rent a car for an hour, have Enterprise pick me up, then take the car to get my bike, drop off the car, and bike home. But Enterprise does not rent cars by the hour, and the one-day fee seemed excessive to my needs. Blah. My new plan became "take bus to the bike shop, then bike the 2.5 miles to rental car place, then bike the 3.6 miles home". This is a short ride by my standards: my usual after-work ride is around 10 miles. I brought my backup phone to work, hoping I could write on it, but its keyboard is in terrible shape, with many keys often unresponsive. I wrote a few hundred words using the virtual keyboard, but it was just too painful to do any real work on. I left work at 4PM, so I'd have some slack if I missed the connecting bus. The best possible time was 38 minutes, but I took an hour instead. I was ridiculously anxious through the bus trip. Not having my phone and not being able to confirm things on the fly with the net made me nervous. When I finally got off the second bus, I got half a block away before realizing I didn't have my lunch bag. I hurried back to the bus and made the driver wait while I tried to retrieve it. The bus was full of helpful people trying to soothe the crazy lady who didn't understand how buses worked and lost stuff. One nice woman who'd been sitting next to me at the bus stop exclaimed: "Oh no! Was that black bag yours? You left it on the bench at the last stop." I got my bike from the shop, and a new helmet because I'd forgotten mine and I was supposed to replace it anyway, and Rick threw in a bungee cord so I could tie down my purse, because I hadn't brought the bike basket along when I gave him the bike. Then I set off for the rental car shop! Within a mile, I already felt kind of unwell and nauseated, surprisingly so. It was a hot day, 95 or so, but I often bike in that kind of heat and it's never been a problem unless I've gone for several miles without shade. But I made it to the rental car shop without incident, collected my phone, and set off to Wal-Mart to see if my bag would still be where I left it at the stop. Even with going back to the bus stop, the whole trip would still only be 7-8 miles: again, shorter than I usually do. I started to feel faint as I biked up a long gentle slope a half-mile or so shy of Wal-Mart. Maybe I should catch the bus at the Wal-Mart stop, and skip the last 2-3 mile ride to home, I thought. In the last blocks before the bus stop, I started talking to G-d, which is a thing I do now and then and don't usually write about. I'm not entirely sure why I don't write about it. Because it's navel-gazey? Because I'm not properly religious? Because don't want to inflict the disquieting experience of listening to other people talk about their take on religion on my friends? These are pretty good reasons. But I will write about this bit anyway, because it amused me. "So, hey G-d," I said, out loud because I don't care if passing cars think I'm a crazy person. "It's been a long time, and I have no right whatsoever to ask a favor of you because this entire situation is my fault and the result of me not paying enough attention to what I'm doing and the things I'm supposed to take care of. But I would still really appreciate it if my lunch bag would be where I left it. And if not, that's okay too. It only costs money, and that's what money is for." I gave a little sigh. "It seems I've been saying a lot of that lately. Anyway, that's enough about me. How are you? Work going all right?" I don't think G-d talks to me any more than he talks to everyone else in the world, which is to say "all of the time but usually we don't understand and even when we think we're listening, we've got a good chance of getting it wrong." I didn't hear an answer, but I started grinning anyway, with this sense of G-d spreading his arms: "Hey, I've got the best job in the world!" I laughed. "You're only saying that to cheer me up. You've got a terrible job. People are always asking You for stuff." And then I smiled more, because it didn't work. I couldn't picture G-d moping. "Okay, fine. God's job is great." I laughed. "And yes, the cheering-me-up part is totally working." I arrived at the bus stop. My bag was not on the bench where I'd been sitting. A man standing nearby said to me, "Are you looking for your bag? I put it on the bus." He pointed to a bus waiting to leave. I marveled at my timing, hopped on, retrieved my bag, and thanked the nice man. At this point, I should've loaded my bike on the bus's bike rack and taken the bus home, but I thought I was feeling up to biking the last few miles. This was ... true in the sense that I did in fact bike the last few miles to home, and false in the sense that I had to stop three times to rest because I was worried I was going to fall off my bicycle No idea why this ride was so grueling. Ugh. Lut and I don't have a working car, so I rent a car about once a month so we can get groceries and run errands. During most of the year, I get a car from Friday afternoon to Monday morning, because Enterprise has a $10-a-day special from autumn through spring for Friday-to-Monday rentals. But they don't run this special from Memorial Day through Labor Day, so I only get a car for one day during the summer weekends. When I rented a car at the beginning of June, I got it from 2PM Saturday to 2PM Sunday, because I remembered my local Enterprise was open from noon to 3PM on Sunday, so I could get a ride home at 2PM. I arrived at 1:45PM and discovered they'd changed their Sunday hours to 10AM to 1PM. I drove home, dismantled my bike, put it in the trunk, drove back, put my bike back together, and biked home. So this weekend, I reserved the car from noon Saturday to noon Sunday, so I'd be sure to arrive before they closed. On Saturday, I packed up my dysfunctional bike and dropped it off at the bike shop. I really only needed to leave the rear tire, but it turned out he was closing early that day because of the holiday weekend. So I left the whole bike so I could go back for it during the week by bus or whatever, and bike home on it. On Sunday, Lut and I went out for breakfast and to get a last few things from the store. At breakfast, I commented to Lut that I could walk home from the rental car place if I had to, but it'd be an annoyingly long walk and I didn't have the bike to make it now. So I really needed to be sure to return the car before 1PM. When I left the house to return the car, I checked messages on my phone, and put my phone in one of the cup holder slots during the drive over. At the rental car lot, I parked, locked the car, unlocked the car, did a once-over to of trunk, backseat, and front seat to make sure I'd gotten everything. I noticed my rental agreement curled in one of the cup holders, so I pulled it out. I locked the car again and went over to the building's front entrance. I checked the side entrance. CLOSED FOR HOLIDAY JULY 3-JULY 4. Guess I can walk home. It's only 4-5 miles, I thought. (Turns out to be even shorter -- 3.6 miles). I dropped the car keys in the return slot, and started towards the street. I reached for my phone: I can write while I walk! Except that it's not in my pocket, or my purse. Did you notice what I didn't grab out of the car when I did my final check? YES THAT WOULD BE MY PHONE. Grumbling to myself that I wanted a do-over for the last minute, I started across the street. I kind of had to go to the bathroom, and there was a gas station a hundred yards in the opposite direction. But I didn't really have to go yet, and there was another gas station about halfway between the rental car branch and my house, so I figured I'd stop there. Determined to make SOME use of the time even if I couldn't write, I set about plotting the next several scenes of Birthright in my head. I thought about exactly what needs to happen, and in what order, and how the climax will unfold. About thirty minutes later, I got to the gas station. The clerk told me they don't have a bathroom. I walked the rest of the way home, plotting out bits of novel and actually pretty happy, because I could finally see what it was that I needed to do next, and where everything had been leading. My toes started to develop sore spots -- I dunno what it is with my big toes now, but if I walk more than about 1.5 miles, I start to get blisters around the bottom joint of the big toe on each foot. I noticed this when I was visiting my parents, because my father and I went for a 2-mile walk each morning. When I got home, I commented on this confluence of unfortunate events to Lut, and he said, "That's the kind of sequence that would make me furious if it happened to me." But I'm actually in a good mood because I KNOW WHAT HAPPENS NEXT IN BIRTHRIGHT NOW. I can write it! Maybe even quickly! So the first thing I did (well, after using the bathroom), before I even wrote this, was write dump a detailed outline for the next events out of my head and into a text file. I have 950 words of outline now. Yeep. So the dentist visit was to check on a tooth that has been checked on three times in the last eight months. In November, he filled a cavity in it and warned me that it might be dying. "But I don't think so, because it would hurt a lot more." It mostly stopped hurting after that, but I went back a week or two later because it'd started again. He filed down a high spot and I left. Five months later, it started hurting again when I chewed on that side. I went in, had the filling filed down again, he warned again that it might be a problem at the root "but it would hurt probably hurt more, so hopefully not." It stopped hurting again. Last week, it started hurting when chewing on that side again. It still didn't hurt much -- like a 1. It had never risen above a 2.T he top felt sharp, like a broken edge. I made an appointment yesterday for today. It had fractured down the middle. So he poked about to see if he could salvage it with a root canal, but nope. Dead tooth. He extracted it. Now I have a giant hole and a mouth full of wet gauze and a dentist convinced I have insane pain tolerance. I wish I had insane pain tolerance. The giant hole hurts a lot more than the tooth had. It will probably be a week or two healing. I am at Walmart, waiting for the three different prescriptions to be filled: painkillers, antibiotic pills, antibiotic rinse. Then I guess I'll go back to work. Today is going to be awful anyway. I might as well get paid for some of it.